An updated and expanded, free 568-page book on verse as an art form — a practical guide to writing verse in traditional, Modernist and Postmodernist styles. Illustrated with copious examples ranging from Chaucer to contemporary American poets, plus hundreds of Internet links, this guide bridges the gap between self expression and the production of professional work worthy of detailed literary study. 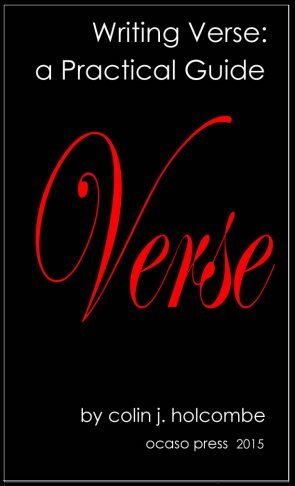 The theory sections explain not only what poets are and have been trying to do, but why verse takes its often stylized forms. The opening chapters cover the theory and aesthetics of verse, genre considerations, sentence structure and rhetoric, stanza forms and word choice, sound patterning, metaphor and imagery, metre and rhyme. Then follow chapters on the sonnet, lyrics, rhyming couplets, ode, pastoral elegy, light verse, blank, narrative and dramatic verse, modenist and postmodernist styles, and performance poetry. The book concludes with a step by step guide to verse construction, a chapter on translating Italian, French, German and Sanskrit poetry into English forms, and a final 50 page bibliography. Verse is a means to an end, a step towards what may, with the right gifts and effort, become poetry. It enables a piece of writing to be effective, moving and beautiful. Verse gives structure to lines, and so liberates words from their everyday uses and connotations. And words for poets have special meanings, appropriate uses, associations, connotations, etymologies, histories of use and misuse. They conjure up images, feelings, shadowy depths and glinting surfaces. Their properties are marvellous, endless, not to be guessed at from casual inspection. And each property — meaning, association, weight, colour, duration, shape, texture, etc. — changes as words are combined in phrases, rhythms, lines, stanzas and completed poems. Out of these properties the poetry is built, even if the end cannot be entirely foreseen but grows out of the very process of deployment, that continual, two-way dialogue between writer and poem. An analogy may help. We are born into language, using its words and ready-made phrases to get through our busy lives. From those words and sometimes complete phrases we make poetry — a poetry that is therefore ever latent in language. What verse does is to select, organize and shape that language, just as the radio set picks up and converts into sound what we otherwise can-not hear. Far from constraining language, therefore, verse gives it greater possibilities, significance and responsibilities. Verse is an enabling mecha-nism, but through terms and traditions that have to be learned. Perhaps insulated by a belief in the superior properties of free verse, the great majority of would-be poets making up literary circles and workshops — articulate, well-read and perceptive students — generally have only the most rudimentary ear for traditional styles. And if that's an extraordinary situation, it is one repeated in many of the experimental arts where the critical theory is ab-struse and taxing but often produces something prosaic in the extreme. The craft aspect is entirely overlooked, though it must be self evident that trying to write poetry without developing an ear for verse is akin to writing an opera while remaining ignorant of music. Opera lovers can dispense with the technicalities and trust their simple passions, but composers and critics have to study everything possible, from music theory to the efforts of past composers, generally adding proficiency in some musical instrument to their skills. 1. The old styles are still needed for translation from formal poems in other languages. Free verse forms aren't generally successful. 2. Being the more demanding, the old styles train the ear more thoroughly, just as contemporary dancers generally learn the basics of their art through ballet. Not only train the ear, moreover, but help give the poet a wide dexterity in handling words, all the more needed in contemporary styles that largely dispense with poetic devices. Some of the most pleasing free verse was written by the early Modernists, of course, who enjoyed the best of both worlds. The emphasis of this book is on the practical, a belief that poets will learn more of the strengths and weaknesses of all styles by actually writing them than by reading books on literary criticism or theory.